Distribution of First World War wrecks within the Devon study area (image credit: Contains public sector information, licensed under the Open Government Licence v2.0, from the Maritime and Coastguard Agency). 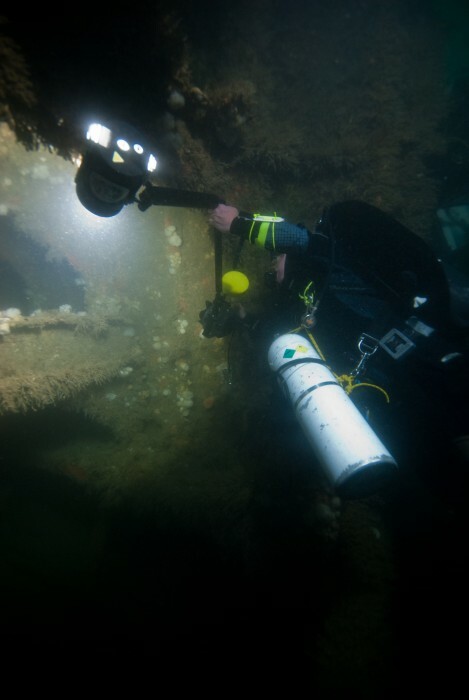 As part of the Forgotten Wrecks project this summer the Maritime Archaeology Trust sent out a team of divers to find and document a number of WW1 wrecks off the South Devon Coast. In order to assist the divers in finding these wrecks bathymetric maps were consulted. Much like navigational charts used by mariners these maps show the topographic features of the seafloor. 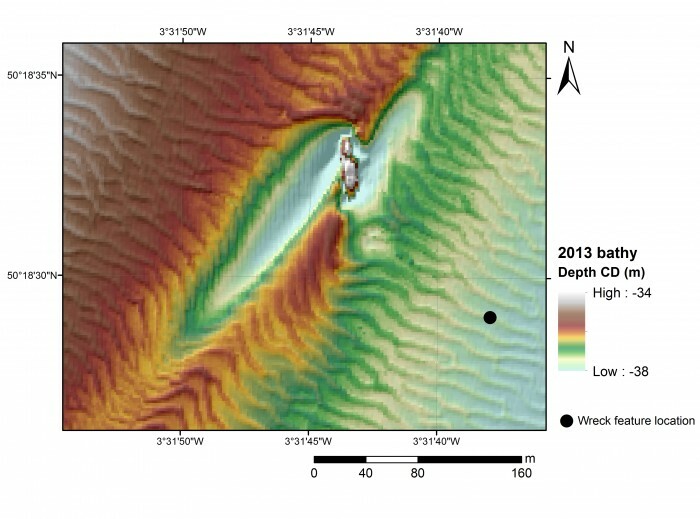 However, modern techniques such as multibeam bathymetry, paint a far higher resolution image of the seafloor with measurements made every few metres. 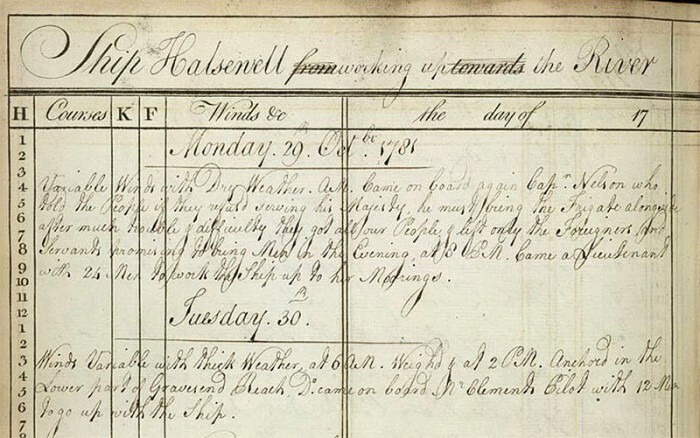 As a result, even fine details such as the orientation of shipwrecks and the positions of larger objects such as boilers and anchors on these sites, can be seen. 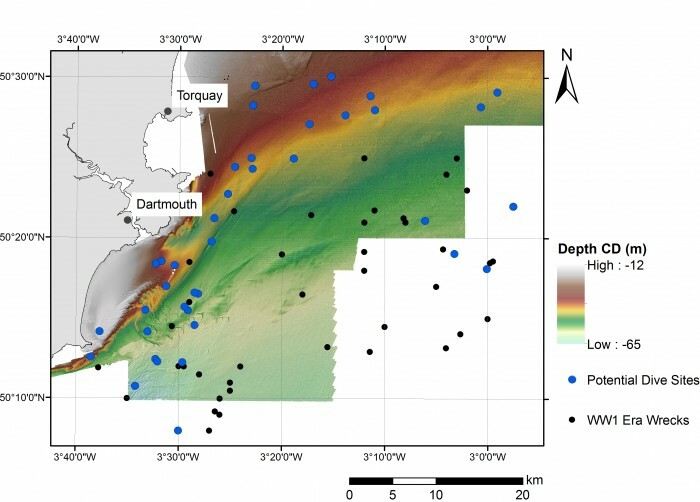 Within the area surveyed by the Maritime Coastguard Agency between 2012 and 2015 (data freely available from aws2.caris.com) 31 of the 48 wrecks which had been identified as lying within the south Devon study area reviewed ahead of diving operations were visible. Once identified a zoomed in map was created of each wreck. The examples shown here are of the British Navy trawler, the Benton Castle and cargo ship, the Newholm. Both of which sank after hitting mines, leading to the loss of 30 lives in total. These images and images of the other wrecks were used by the diving team to help select individual sites to dive and then plan their dives more effectively. 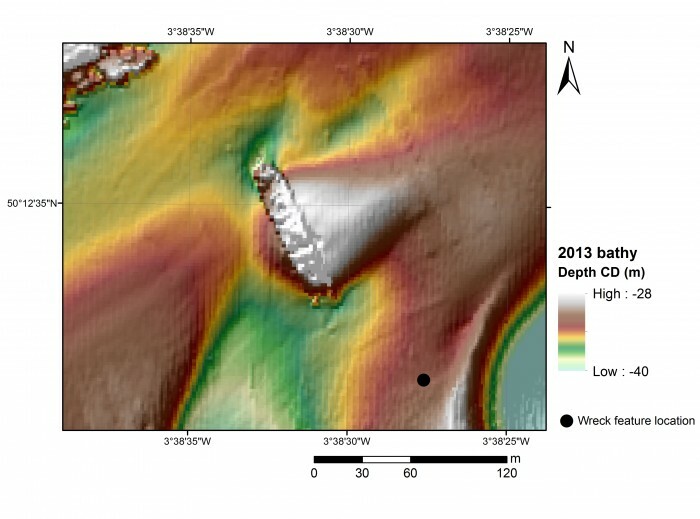 Geophysical survey image of the Benton Castle (image credit: Contains public sector information, licensed under the Open Government Licence v2.0, from the Maritime and Coastguard Agency). Geophysical survey image of the Newholm (image credit: Contains public sector information, licensed under the Open Government Licence v2.0, from the Maritime and Coastguard Agency). The dive team operated out of Dartmouth using Falcon Diving Charters (http://falcondivingcharters.com/) during the week of 27th June to the 1st July. Despite some challenging weather conditions the team managed to reach a number of the Forgotten Wrecks to undertake survey and photogrammetric recording. To find out more about the Forgotten Wrecks of the First World War project, click here. Diver photographs detail of the wreck structure of the Newholm. 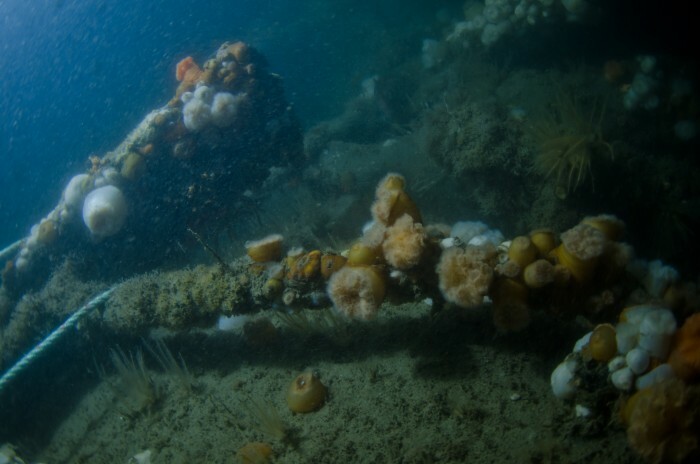 Marine life encrusts the remains of the wreck of the Benton Castle. Bouldnor Cliff isn’t just important from a British perspective: it is a unique site that interests people from all over the world! 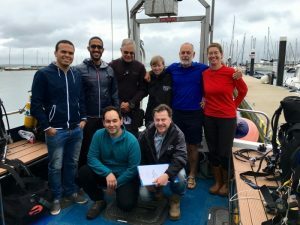 The diving team included archaeologists from the Maritime Archaeology Trust and even two divers who’d traveled all the way from Egypt to help with the work and see the remains of the Mesolithic settlement. Ziad and Mohamed flew to Britain when volunteers were needed to join the Bouldnor Cliff survey, and came to help with the photogrammetry work around the site. 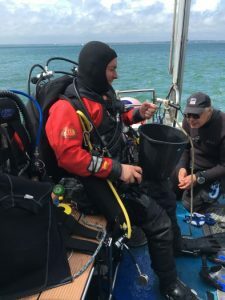 They’ve done work all around the world, including in Montenegro, Lebanon, Egypt and Italy, but this was their first time diving in the U.K.
Ready for that renowned British summer, Ziad and Mohamed joined the team on the boat, keen to explore the famous site. Undeterred by the wind and rain of the first day (it is summer, after all), they were ready to get stuck in and brave the chilly Solent. Layered up and as prepared as can be for the colder climate they jumped in to get to work. The cold was no match for their enthusiasm and they worked hard, familiarising themselves with the site and the new conditions. 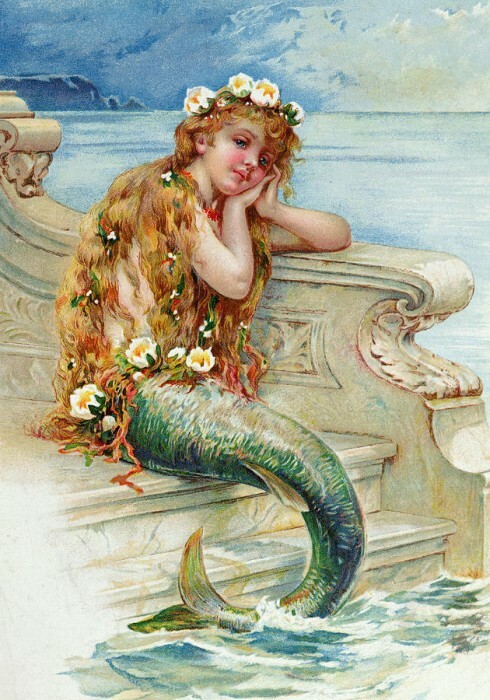 And what did they have to say after their first dive? Ziad had only one word: ‘challenge’! 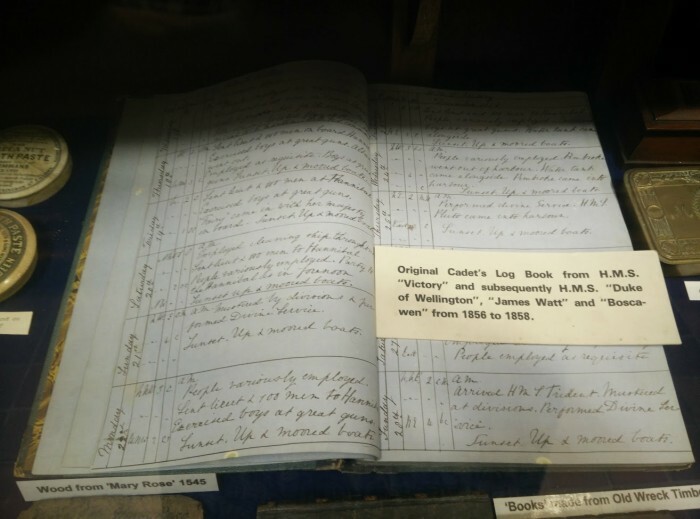 Now used to the cold and the weather, they carried on diving on the site, contributing hundreds of photos to the photogrammetric survey, and taking footage on a GoPro. Their dedication is such that the skipper even poured warm water into their wetsuits before a dive! Inspired by Ziad’s one-word summary, Mohamed described the site as an ‘adventure’. Ziad and Mohamed aren’t the only members of the #SaveBouldnor team from abroad – Sarah is from the United States, and Miguel is a PhD student from Lisbon, Portugal. Sarah works at the Maritime Archaeology Trust, and considers the site to be ‘groundbreaking’! Miguel came to Bouldnor Cliff to gain experience in a new environment, and to improve his skills in 3D reconstruction and recording. Miguel described the site as ‘exciting’ and has contributed a lot of work to the photographic record. It’s not just maritime archaeologists who find Bouldnor Cliff fascinating – Andy has worked closely with the Trust for fifteen years. 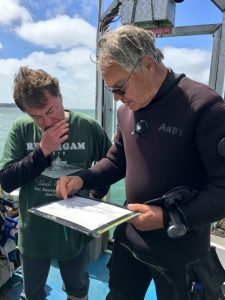 He finds the site ‘remarkable’, and, as a long-time diving enthusiast, is helping out on-site. 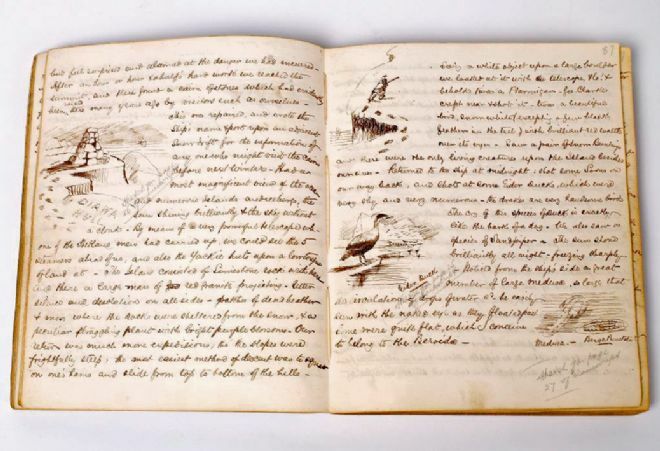 Bouldnor Cliff is a special site that is always turning up new information and fascinating artefacts. It has something of interest for people from all over the world, from different backgrounds, and this multi-national team has come together to work to save Bouldnor, and learn its secrets. Work like this is invaluable, and will contribute to the continuing record of Bouldnor Cliff, as the MAT monitor the site’s condition and explore new features. Another day on Bouldnor Cliff reveals another exciting discovery. Garry Momber took part in the day’s first dive, and began to clear away some of the layer of mud covering the site. Underneath this mud he found a series of planks lying parallel to each other. Further dives will include more work on this potential platform, so the archaeologists can try to interpret the feature and its purpose. Yesterday, a diver found and recovered a small piece of flat, pointed timber that may turn out to be the end of a plank. Garry also recovered a small piece of wood, demonstrating the excellent preservation on this site. It is still possible to find organic material that is over 8,000 years old! Miguel, Ziad, and Mohamed are still hard at work on the photogrammetric work. 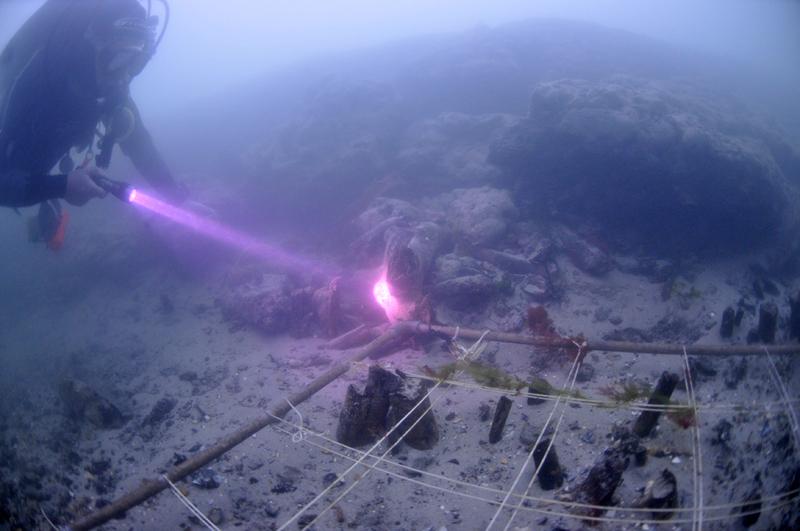 Miguel has been acting as underwater photographer, taking pictures of Garry at work and using a 6m x 2m grid to take photos to create a photogrammetric model of the site and some of the exposed timbers. Ziad and Mohamed are doing similar work, both with and without photogrammetric targets. The divers are working hard to ensure they don’t damage any of the exposed timbers as they do their work, and are being careful where they use targets. In places where the timber is fragile, it may be better to work without them. Eventually, the hundreds of photos taken will be combined together. They will be used to create a 3D model of the Mesolithic site, which can be manipulated and interpreted, and used for further study. To everyone’s delight, the weather is much improved from yesterday, and conditions are much calmer. 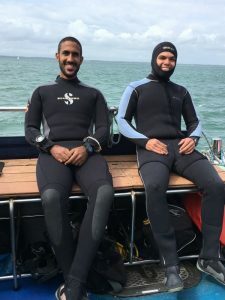 This is Ziad and Mohamed’s first time diving in the UK, but they are coping with the temperatures very well! On the third dive, the divers brought up some more timber which will be cleaned, and then studied for interpretation. Every dive is revealing something new about the site. The researchers are keen to see what else can be learnt from this ancient settlement. Bouldnor Cliff is a unique site, and it has plenty more secrets to discover! This is the last video before we go out diving! 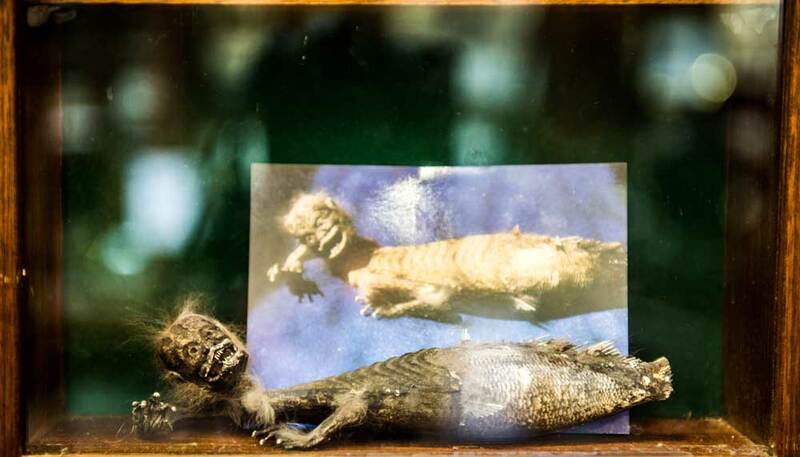 This time Garry is visiting the Sunken Secrets Museum on the Isle of Wight. He shows us various pieces of timber, flint and string that has taught us a lot about the people living here during the mesolithic era. The findings are proving to be highly important, because they show the people were way more advanced than previously thought, by as much as 2000 years. Our second video is out! This time Sara Rich shows us some timber from earlier Bouldnor excavations and tells us what we can learn from them. Bouldnor Cliff #1 Where and what is it? Take a look at our latest video! Garry is on the Isle of Wight discussing what we find at Bouldnor Cliff. He shows us what the submerged forests look like and what we can learn about England in the mesolithic era, emphasising the importance of this site. We are doing our best to retrieve as much as we can before it all erodes away. You can help us save Bouldnor Cliff.